The Medieval village of La Madeleine is just upstream of l'abri de la Madeleine, with l'abri Villepin downstream from l'abri de la Madeleine. All are above an important ford over the Vézère. Autograph of Peyrony on the paper sent by him to the Comte de Saint-Périer. René de Saint-Périer (comte de Poilloüe de Saint-Périer) was a naturalist, archaeologist and French prehistorian. 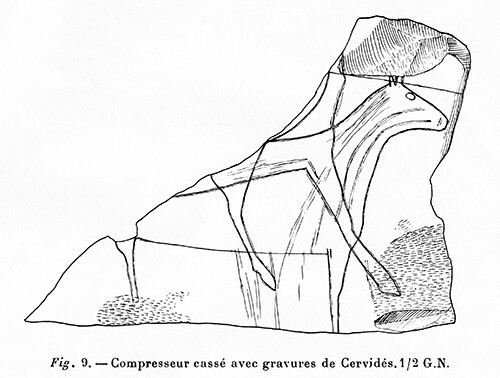 He was curator of the Musée d’Étampes, and discovered the Vénus de Lespugue in the grotte des Rideaux à Lespugue, Haute-Garonne. He wrote an important book on the Caves of Isturitz and Oxocelhaya. 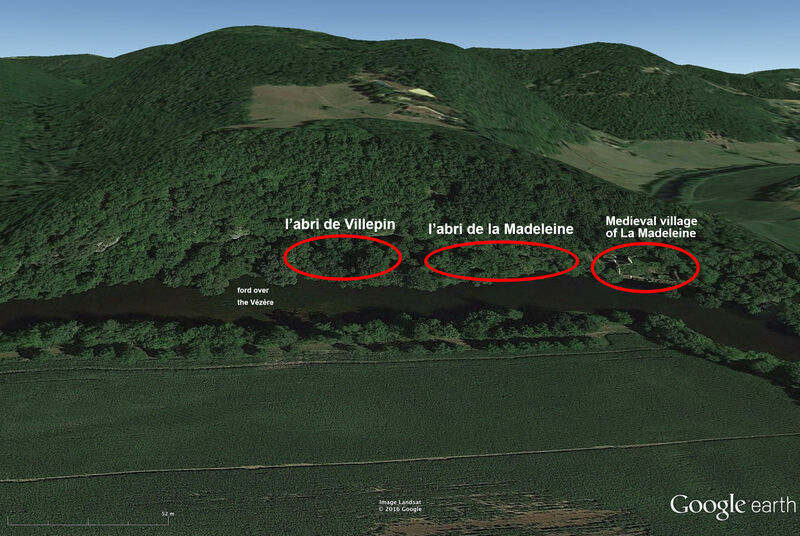 Villepin is a delicious and wild corner that opens away before us, 50 metres downstream from the much larger abri of La Madeleine, already described by Dr. Capitan and myself. The tongue of land between the Vézère and the cliff is covered with a lush vegetation of oaks, hornbeams, and especially boxwood, often connected together by clematis and thistles, forming a tangled mess, a true corner of virgin forest. The undergrowth has a width of 2 metres, and is 10 metres long. Passing through this barrier easily enough, we reach the partially collapsed shelter. With the permission of the owners, Mme and M. de Villepin, whom I thank cordially, I was able to undertake research in this beautifully exposed south facing location. Number 2: longitudinal cross section. 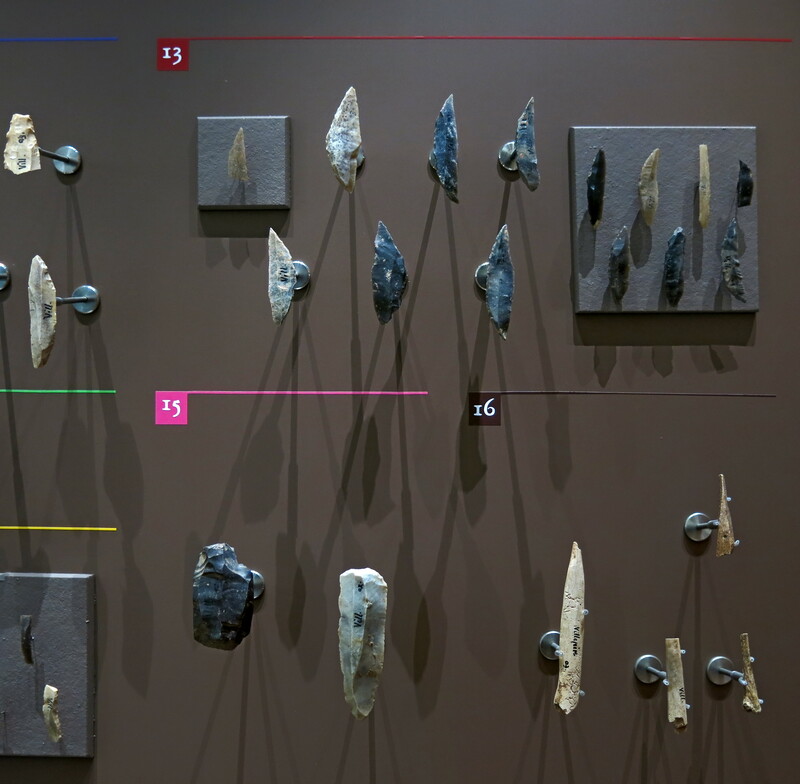 A pilot survey in front of the abri gave some flint objects and a lot of debitage. Right from the start the area seemed to be an archaeological site. To gain some idea of its nature and importance, a trench was dug perpendicular to the back of the abri. The relevant cross sections are shown in the diagrams above. A: On a sandy clay alluvial base rested a brown layer on average 10 cm thick, at most 15 cm thick, covered by a sandy layer 60 cm thick. B: Of the same colour as A, layer B was of similar thickness, and was topped over nearly its entire surface by a thin silt layer not exceeding 2 cm in thickness. C: An archaeological layer above the silt layer. D: The lower layers were covered by a layer of earth and limestone scree. During the excavation, I mapped a longitudinal section which complements the previous section and gives a more accurate picture of the composition of the deposit (Fig. 1, No. 2). 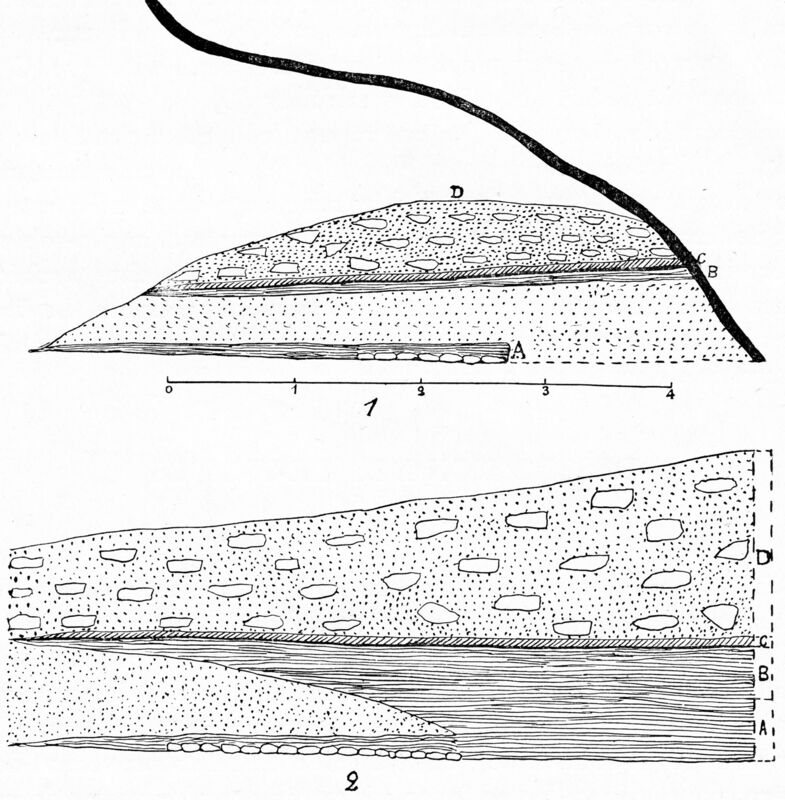 On the left, the lower layer (A) was clearly separated from the layer (B) by a sandy clay soil ending in the corner to the right, where the two archaeological layers joined together. Silt and then level C covered it all, as before, and were topped by limestone boulders and earth (D). Over a length of 250 cm and a width of 110 cm, the floor was paved with rocks and pebbles from the Vézère, to facilitate the installation of a hearth: it is one of the largest of those found so far. It is assumed that this arrangement of stones, found in many deposits of the Upper Paleolithic, helped to ventilate the fire, but it could also be used as a grill. If raised to a high temperature, and the charcoal and ash was then removed, it was capable of cooking large cuts of meat. The lithic industry collected in this level is nothing out of the ordinary. 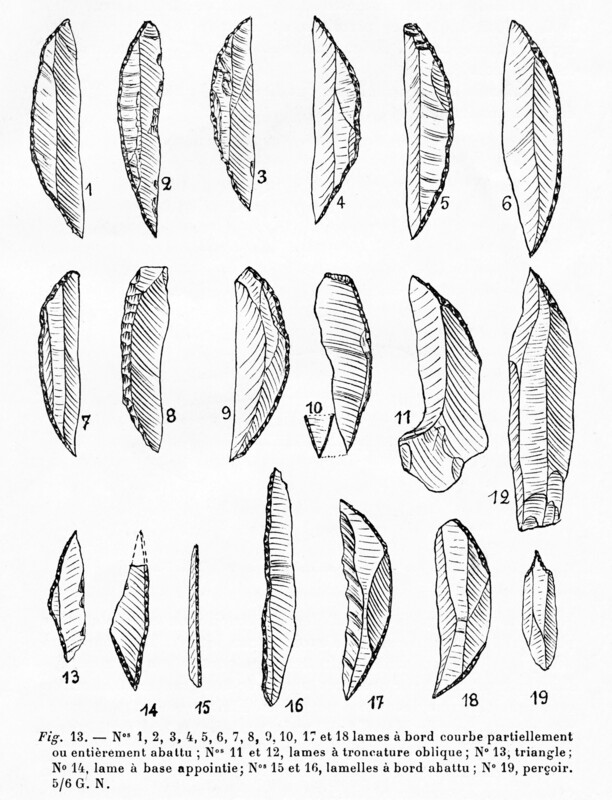 It includes scrapers on blade tips, various types of chisels: straight, angled, flute, transverse, etc, parrot beaks burins, knife blades, drills, awls, some backed blades, some atypical shouldered points, a few rare nucleiform (core shaped) scrapers, compressor pebbles, nuclei, hammer stones and a set of makeshift tools that are difficult to classify. 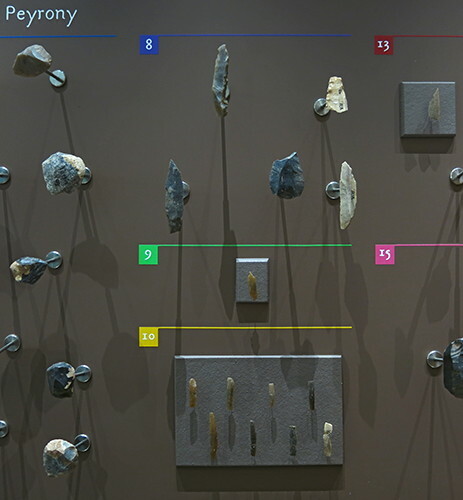 This ensemble is classified in the first half of the Magdalenian level of bilateral barbed harpoons (the lower part of the Magdalenian VI of Breuil). The bone industry of layer A, made up of mammoth ivory and reindeer antler, is made up of long spear points, sometimes broken off, (No. 1) with double bevelled bases striated obliquely, as well as double rowed harpoons with closely spaced barbs on the shaft (Nos 2 and 3), with a longitudinal furrow on each of the barbs, with a similar furrow in the barrel. A fragment (No. 5) of the same type as the previous ones, bears on its middle part two arcs of a circle arranged almost symmetrically, their convexity turned outwards. Also found was a fragment of reindeer antler with lines and shallow incisions in various directions (No. 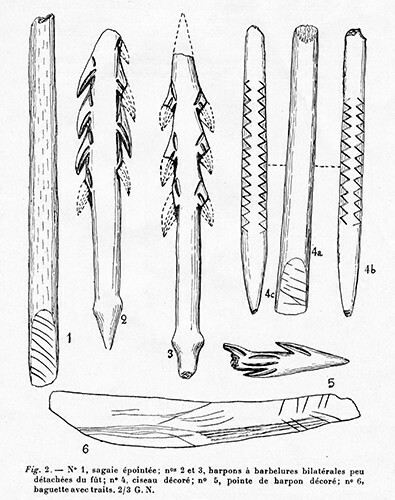 6), needles, awls, fragments of pierced batons without ornamentation and 'chisels', which last are usually decorated. No. 4a was originally a double-beveled spear point, which, when broken, was transformed into a chisel as shown here. The two sides (b and c) are decorated with incomplete diamond shapes (or zigzags) juxtaposed in relief. No. 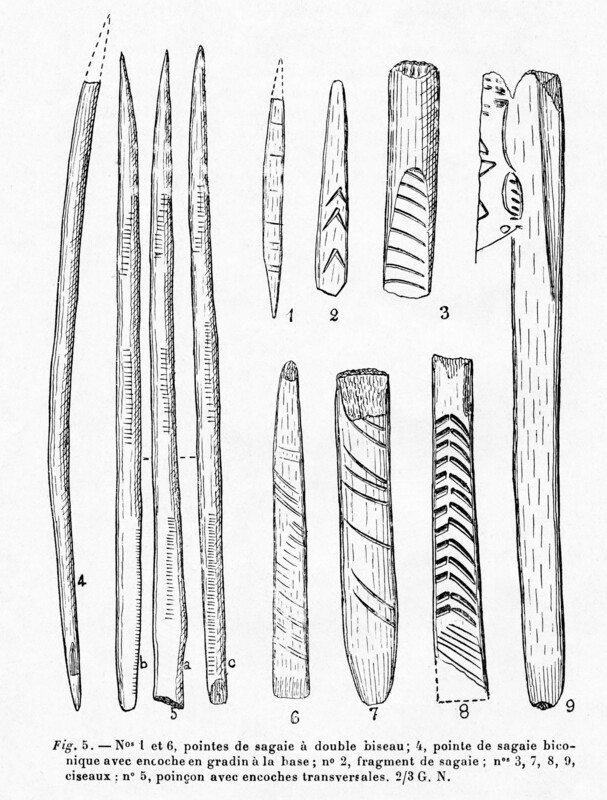 1 (left) is another chisel obtained in the same way from a broken spear point. The sides are decorated with two-by-two symmetrical drawings which appear to be derived from the stylisation of a fish. Finally, No. 2 is decorated laterally with triangular reliefs, symmetrical in pairs, referring to animal heads, especially the superior of No. 2b, where the eyes and the mouth are clearly indicated by indentations. The flint industry of this layer consists of all the pieces found in the previous one and others which are only found at the very end of the Magdalenian: blades with rectilinear or concave truncation, either at one end only (Fig. 4, Nos. 5 and 8), or at both (Fig. 4, Nos. 1 and 2), large knife blades (Fig. 4, No. 4), some of which were backed (Fig. 4, Nos. 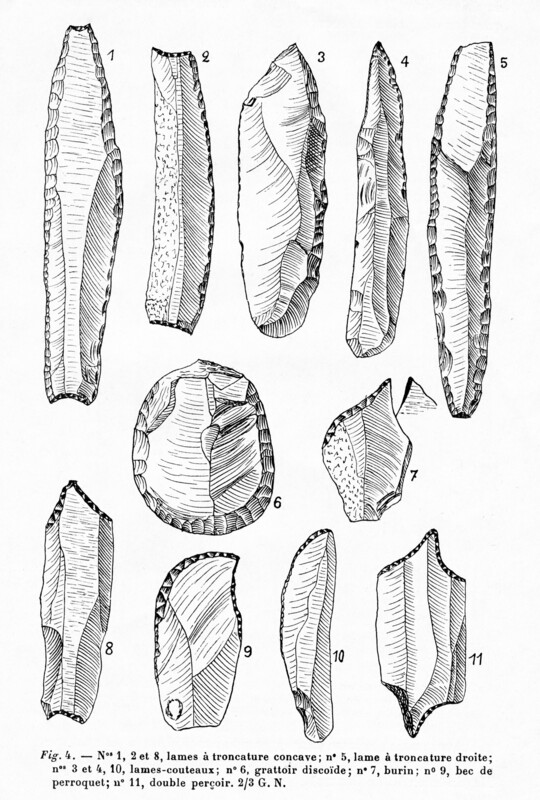 3 and 10); large, almost discoidal scrapers (Fig. 4. No. 6); burins with abrupt retouches on one side and a burin blow on the other (Fig. 4, No. 7), some perfect parrot beak burins (Fig. 4, No. 9). There was also a double awl or large drill (Fig. 4, No. 11), stone compressors or retouchers, quartzites whose surface is ochre-tinted and therefore appear to have been used as ochre crushers, pieces of red sandstone having been used to flatten or polish bone tools. Numbers 1, 2, and 8, concavely truncated blades. Number 5, a straight truncation blade. numbers 3, 4 and 10 knife-blades. number 9 parrot beak burin. A rod engraved with a line of horses. Nos 1 and 6, spear points with a double bevel. No 4, biconical spear point with a stepped notch at the base. No 2, fragment of spear point. Nos 3, 7, 8, 9, chisels. No 5, awl ( spear point? - Don ) with transverse notches. 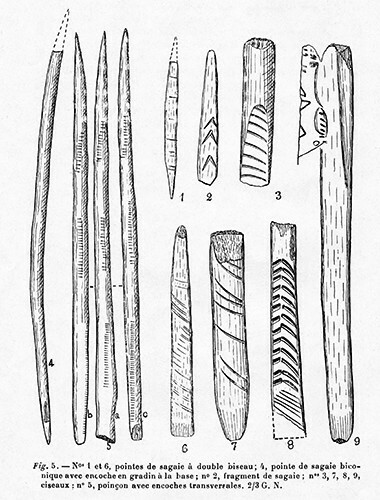 Other examples include a long wooden rod of reindeer antler 40 cm long, a large awl ( spear point? - Don ) (Fig. 5, No. 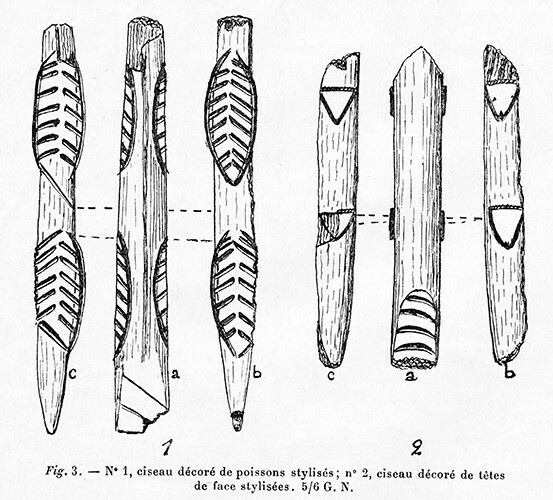 5), with three sides shown here, with on each of these sides three sets of fine notches, as well as double-bevelled spear points (Fig. 5, No. 1) with transverse incisions along the whole length, and two fragments of others, one of which is adorned on one side with deep acute angles (Fig. 5, No. 2), and the other with fine oblique striae (fig. 5, No. 6); chisels with oblique lines on the bevel (Fig. 5, No. 3 and 8) or longitudinal lines (Fig. 6, No. 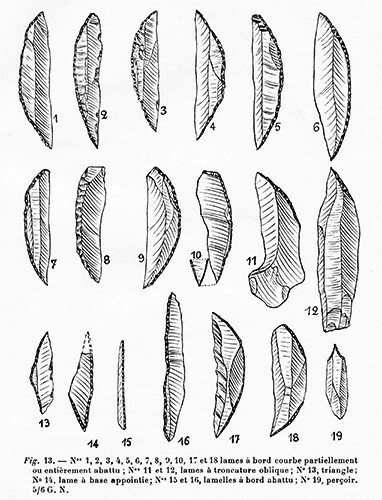 1a), just as if these parts had been made, as previously mentioned , as the base of spearheads; others have a bevel which is smooth, polished and flat (Fig. 5, No. 7 and 9). No. 1, chisel decorated on the edges. No. 2, fragment of a decorated pierced baton. There were fragments of pierced reindeer antlers, one of which has straight transverse cuts as well as two curved lines (Fig. 6, No. 2). 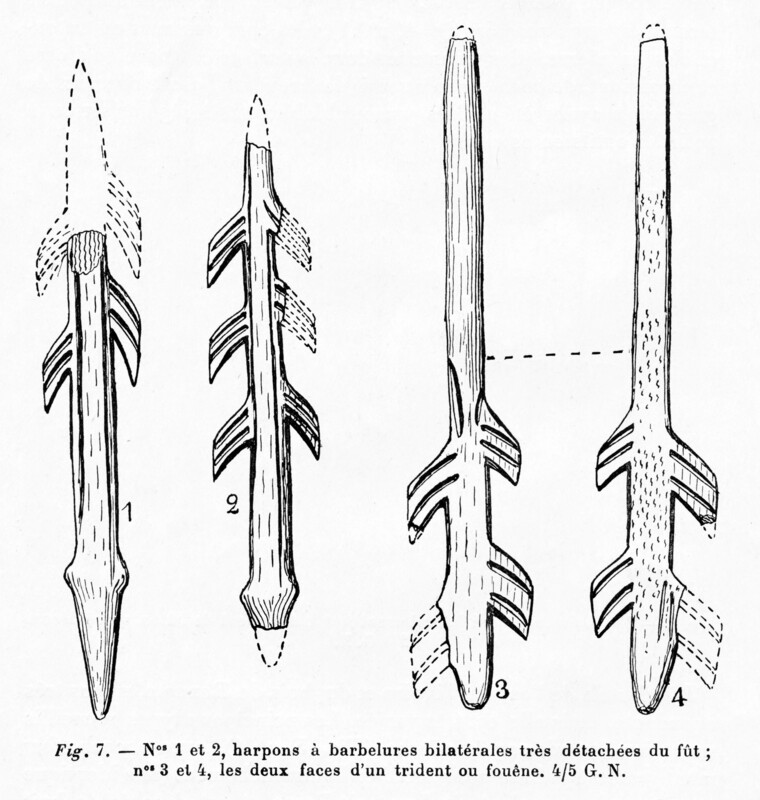 There were some double row harpoons of quadrangular barbs, very detached from the shaft, presenting two longitudinal lateral grooves, putting in relief a straight median groove: each of the barbs carries, on each face, two longitudinal and parallel deep incisions (Fig. 7, Nos. 1 and 2). The bases ended in points which carry, a few centimetres from them, circular bulges which facilitate attachment of the harpoon to the shaft. Nos. 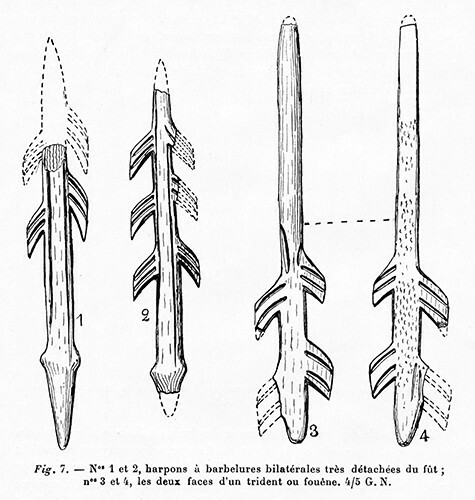 1 and 2, Bilateral barbed harpoons with the barbs very detached from the shaft. Nos 3 and 4, an illustration of both sides of one shaft of a trident or fouêne. Besides these common pieces, there are other rarer ones to which I will draw particular attention. The example to which I refer is first of all an artefact with a double row of barbs identical to those of the harpoons (Fig. 7, Nos. 3 and 4), already described elsewhere; but here, the beveled rod, for fitting, is placed in the opposite direction of the barbs, and the tip, a little crushed by use, only slightly extends beyond the lower barb. It seems that this object was part of a fouêne ( also foêne, foène, fouane, fouëne, fouine - Don ), used in the manner of the tridents of our fishermen, that is to say to take the big fish of the river: salmon, carp, pike, etc. 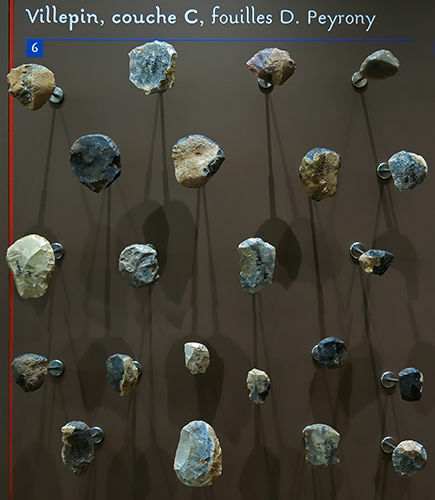 Smaller versions of these tools appear from the end of the Magdalenian level (the Magdalenian V. of Breuil) as harpoons with a single row of barbs, and I have reported them from La Madeleine. I presented some of them to the Congress of the French Association for the Advancement of Sciences of Le Havre in 1929. No. 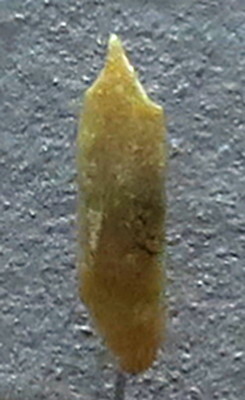 1, serpentiform baguette (fragment of a spear point). No. 2, 3, 4, 5, the four faces of a quadrangular spear point. The second piece is a fragment of a flattened reindeer antler baguette, with alternately broad shallow concavities on the sides giving the edges a sinuous appearance (Fig. 8, No. 1). What could this object be? Perhaps it is a harpoon in which the convexities replaced the barbs, the notch allowing the free flow of blood from the wounded animal. Lastly, a quadrangular reindeer antler baguette has notches on all sides (Fig. 8, No. 2, 3, 4, 5) which are very wide, shallow and oblique on three sides, and on one side (Fig. 8, No. 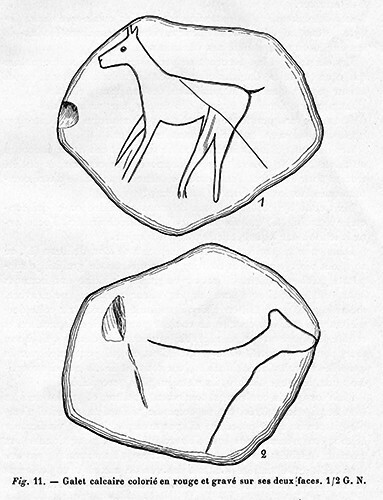 5) with the same peculiarities, but with a middle groove on the upper half passing through several parallel scratches, a very stylised drawing of a horse, and two parallel grooves near the base. This object seems to me to be of the same nature as the previous one and to have been used for the same purposes. 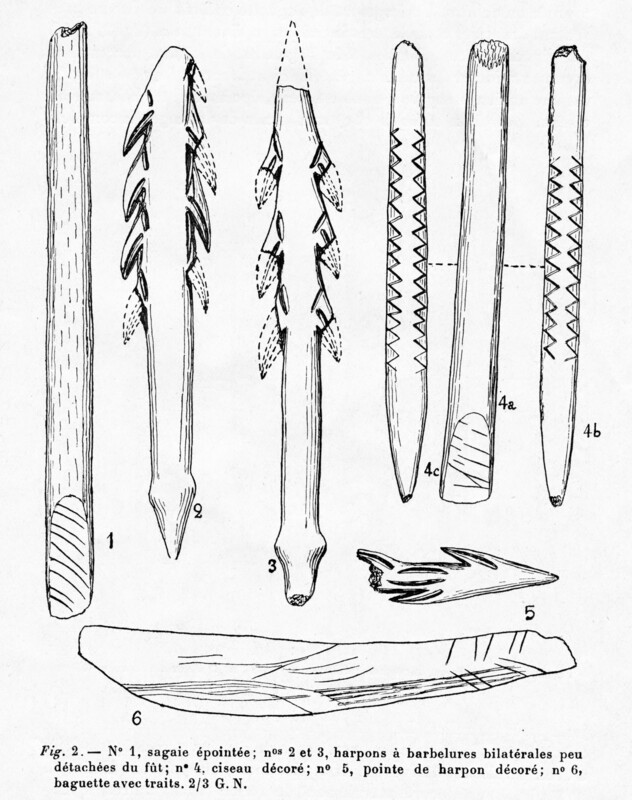 The decoration of objects made of bone, ivory and reindeer antlers often consists of simple transverse oblique lines (Fig. 5, nos. 1, 6, 7) or deep grooves arranged in acute angles in series (Fig. 5, No. 8), or in deep intersecting longitudinal grooves, internally lined with finer lines meeting in acute angles (Fig. 6, No. 1 b). 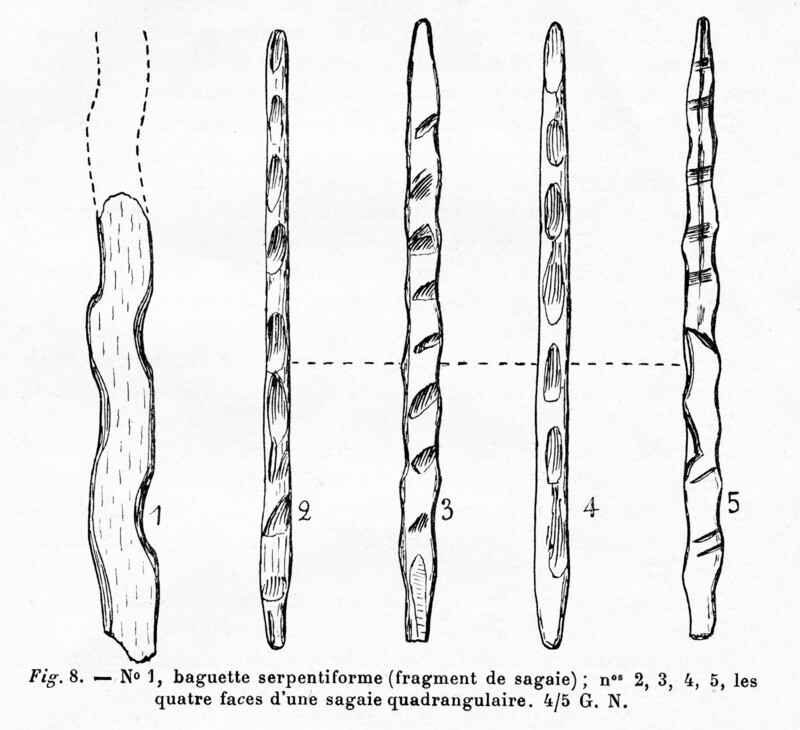 Deep transverse straight incisions and some curved incisions form the only ornamentation of the fragments of pierced batons collected (Fig. 6, No. 2). A large chisel (Fig. 5, No. 9) is engraved laterally with a rather stylised horse, of the same type as the big-headed equines of the pierced batons found by Lartet and Christy at La Madeleine and those encountered at the same time and place by Dr. Capitan and myself on chisels. Finally, on one of the faces of the quadrangular rod (Fig. 8, No. 5), we notice a horse treated in the same way. Of the compressors and retouchers found, three are engraved, some only on one side, some on both. 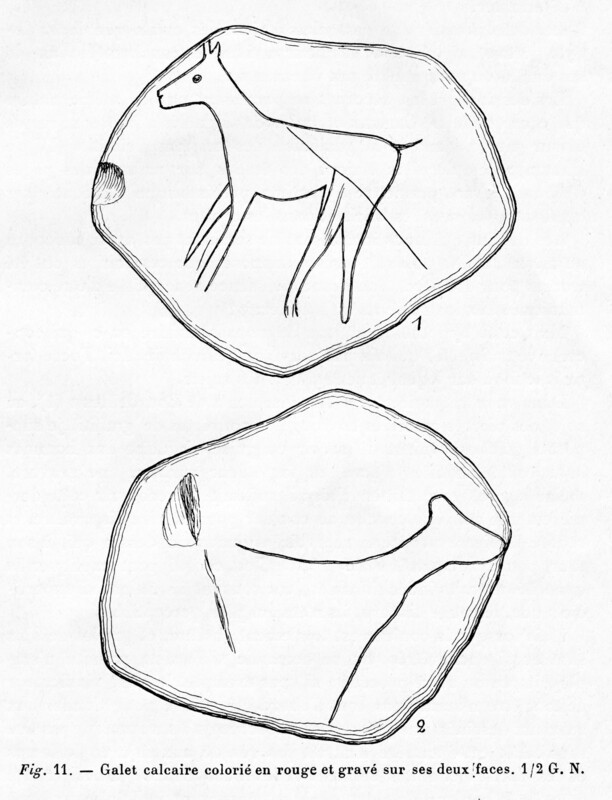 Figure 9 shows a fragmented lithographic limestone pebble with two zones of punctation (dots), and a series of entangled engravings appearing one on top of the other, which appear to be of deer or reindeer. The most complete includes the entire animal profile less the rump and part of the thigh.The head and neck were executed by scraping back the material which makes them stand out. The chest and anterior leg are well rendered, the belly and the hind leg much less well. It is difficult to decide on the species of animal, the stone being chipped flush with the head, at the point of insertion of the horns or antlers. Overlapping this drawing, we note two engraved legs belonging to different animals. The one on the left is a very well made hind leg: hock, hoof and part of the thigh continuing to the belly line. 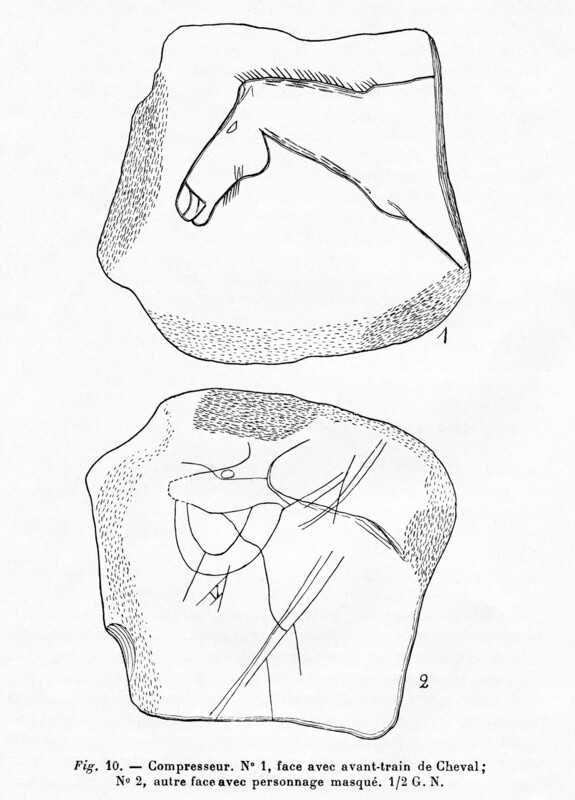 The one on the right is an anterior leg that is also well drawn, but less detailed than the previous one; the chest and part of the belly are part of it. It is unfortunate that the breaking of the stone deprived us of the rest of the scene. Figure 10 represents the two faces of a schistose pebble having also served as compressor. On one face are engraved deeply the head and the neck of a horse, of a style much less realistic than the drawings coming from the earlier stages of the Magdalenian. The proportions and the movement, which characterise the beautiful animal art of that period, are totally missing here. The other side, completely coloured in red, bears a strange figure that can only be interpreted as a masked character like those from Les Combarelles, l'abri Mège, Mas d'Azil, La Madeleine, la grotte des Trois Frères, etc: a large bestial head is supported, under the lower jaw, by an arm, and the rest of the body forms a mass probably covered with a skin. Most of the edges have punctation (dotted) zones produced, either in order to make flint tools such as compressors or retouchers, or perhaps by pushing a flint awl to pierce skins for sewing, used in this scenario as a sewing thimble. The third pebble (Figure 11), smaller and thicker than the previous ones, is made of limestone; it has not been used in work leaving traces, but it carries on all its surface the faded red ochre denoting that at the time, it had been entirely covered with it. On one side we notice an animal running, at a pretty good pace, probably a chamois: the start of the horns is just indicated, the execution leaves much to be desired. On the other side, we see the forequarters of an animal which is very difficult to identify. The first two of these pebbles, described above, were tools that the abri dweller always carried with him to resharpen the blunted edges of his tools, or to sew his clothes. 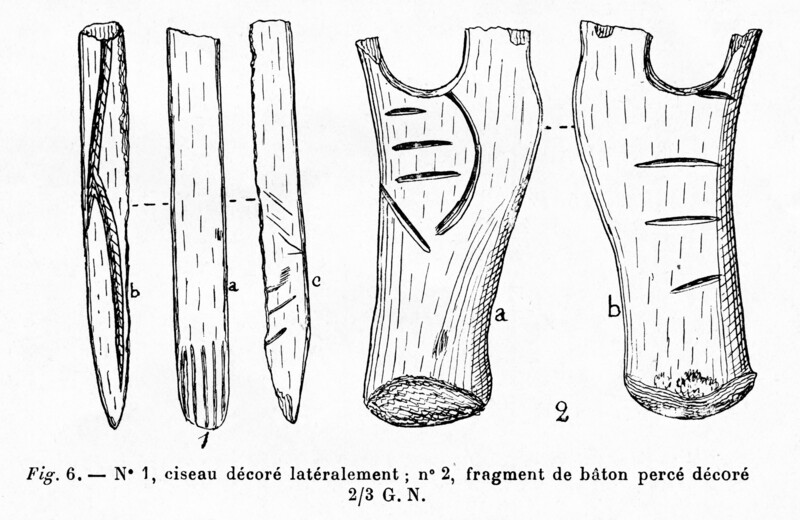 The designs that decorate them do not appear to be of the same nature as those which Dr. Capitan and I have reported numerous times, on bone and stone, in the Magdalenian primitive harpoons (Magdelenian IV of Breuil): these were studies of nature, pages of an album, to allow the prehistoric artist to execute his masterpieces under the shelters and in the caves. The drawings that interest us do not seem to have served the same purpose. Could it not be supposed that these images were drawn to give the tool a power that could be communicated to the instruments it would sharpen? But this hypothesis is far from satisfying to us with regard to the third, which has not served as a retoucher. Here, ochre formed the background on which the subjects were engraved. In my memoir on 'Les deposits de Bourdeilles', Peyrony (1933), concerning the stones coloured in red and covered with graffiti, I supposed that they had been used as a slate by Solutrean men. Coated with ochre all over their surface, an engraving, even a light one, stood out clearly: it was enough to cover the latter with a new layer of color to make it disappear, and to make the stone suitable for receiving a new drawing which, in its turn, could also disappear. This may explain the quantity of indecipherable features, since they were so superficial that, when the red disappeared, they were no longer perceptible. But when the colour is totally absent, and the drawings are so entangled, one wonders if the primitive artist did not originally employ another process. If, for example, the life-giving blood of all beings would not have been first used to give the drawn animals a power, a force they would not have had otherwise, this matter would not have resisted the insults of time and the coated parts would have become clear again. The red ochre being of the colour of blood, but conserving itself indefinitely, under certain conditions, could replace it and have the same magic value. If there had not been for this reason or another, to use red in preference to other colours, we would encounter black backgrounds on which the clear drawings would stand out as well. So far no one has reported this occurrence. The pebble which interests us, covered with red and engraved with a drawing on each face, could it not have been a kind of lucky charm, a fetish which, in the spirit of the one who possessed it, had, by his worship, satisfied the needs of his life, and perhaps those of his tribe? This simple assumption is something that perhaps ethnography would be likely to verify. But whatever the interpretation given, we are here in the presence of a new fact to which I draw particular attention. The fauna was split in two, depending on the level. The lower level had reindeer dominating the rest, with a fair quantity of horse and some deer. In the upper level, reindeer were in a lesser proportion, but included the horse, a few bovines (aurochs or bison), more deer, two wolf canines, a fox, the rabbit and the common hare, and vertebrae of unidentifiable fish. This level, sometimes separated from the preceding by a thin silty deposit from a great flood of the Vézère, was not very thick, on average only two to three centimetres. The industry is clearly different from those previously described. No. 1, burin. Nos. 2, 3, 4, 5, short grattoirs, No. 6 awl, No. 7 knife of the La Gravette type. Drawing and colour photograph of the awl No. 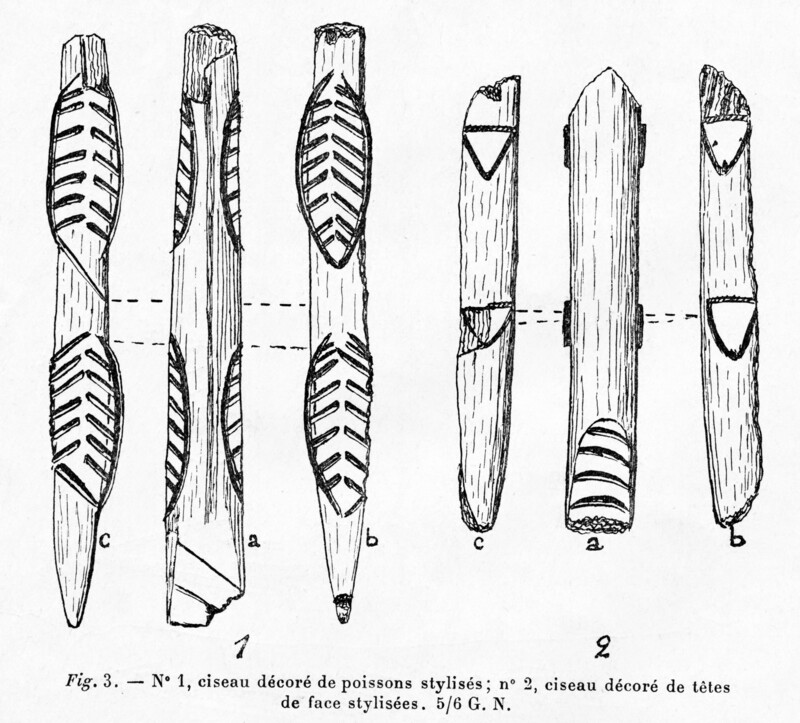 6 from Peyrony (1936) and the similar awl on display at Le Musée National de Préhistoire, Les Eyzies-de-Tayac also from Layer C.
They are probably of the same object. Nos. 1, 2, 3, 4, 5, 6, 7, 8, 9, 10, 17 and 18 curved edge blades partially or entirely blunted/backed on one side. Nos. 11 and 12, blades with an oblique truncation. No. 13 , triangle. No. 14, blade with the base appointie (appointié? ), Nos. 15 and 16 small blades with a blunted edge, No. 19 drill. There was also a large group of blades with a blunted edge, some thin, narrow and straight (Fig. 13, Nos. 15 and 16), but generally curved, reminiscent of the Chatelperron type tips, sometimes with a completely blunted convex edge (Fig. 13, Nos. 1, 2, 3, 5, 6, 7, 8, 9, 10), sometimes partially (Fig. 13, Nos. 17 and 18), sometimes of trapezoidal form (fig.13, No.4) or triangular (Fig.13, No. 13) or with a narrowed base forming a peduncle (Fig. 13, No. 14), or thin sections with oblique truncation at one end (Fig. 13, Nos. 11 and 12), straight blades with a blunted edge (Fig.13, Nos. 15 and 16), small drills (Fig.13, No.19), etc. Drawing and colour photograph of the small drill No. 19. Drawing and colour photograph of a blade (No. 12) with oblique truncation at one end. The bone industry is represented by awls (Fig. 12, No.6). 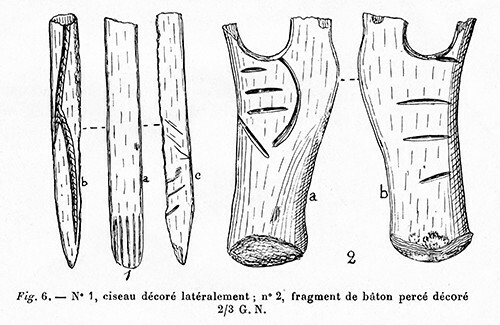 No trace was found of flat harpoons made of antler, so abundant in the Pyrenean Azilian. A fragment of calcareous pebble (Fig. 14, No. 1), bears on one face a series of roughly parallel features arranged in various ways, some enclosing or butting up against the others, but not crossing them. Another whole limestone pebble is engraved on one side with a drawing composed, in the middle, of a rectangle (Fig. 14, No.2), surrounded, at a small distance, by an identical figure not completely closed on the left, whose base is continued on this side to tilt slightly at the end; the left side takes, towards its middle. a direction parallel to the previous line, remaining rectilinear. The upper broken line is initially parallel to the previous figure: on the right it extends in the same direction, while on the left, it makes a slightly obtuse angle downwards, limits the line that it circles, to stop at the end of the two lower sides of the engraving. Finally, the lower line, after having been parallel to its neighbor, forms an obtuse angle on the right by rising, then changes direction to become parallel to the preceding one. This drawing appears to be that of a bird reduced to its essential lines: on the right, the tail (B), in the center the body (A), the neck (C) and the head ended by an open beak (D). It is certainly the most decipherable image of all those known of this time. In the large deposit of La Madeleine, close by, Dr Capitan and I had collected in the rubbble left by Lartet and Christy two calcareous pebbles with lines arranged in part as in fig. 14, No. 1. The first explorers of the grotte des Eyzies cave also collected an oblong pebble engraved identically on both sides. How many similar pieces must have escaped the investigations of the careless diggers! Near these engraved pebbles, I collected a certain number which appeared at first sight to be of no interest. But after careful cleaning, without rubbing them, red parts appeared in places and on a few, with great attention, we noticed traces of points. Were they pebbles coloured like those of Mas d 'Azil, but very faded? Presumably, but it is still too early to be sure. A fragment of stone, appearing to have been part of a cylindrical pebble with flattened and almost polished surface, presents several spots of red ochre to which it is impossible to give a meaning . The remains of large animals were rare. There were very few reindeer, a few horse, more deer than in earlier levels, but a lot of rabbits; Arvicola amphibius was represented by some specimens. The climate had therefore considerably softened. 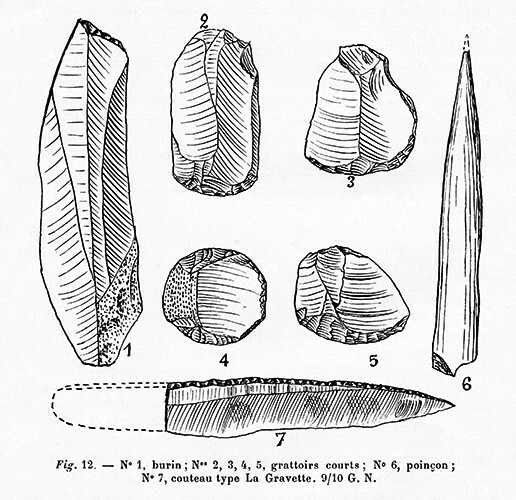 Since 1862, when Lartet and Cristy, the first excavators, began to explore the prehistoric deposits of the Vézère Valley, the vast majority were jumbled, either by researchers for the sale of objects or by experienced diggers, but not always with the care and time necessary for these kinds of researches, although, until the last few years, the Azilian was only characterised by flat harpoons made of antler, as well as painted pebbles. According to this criterion, we would have had in Perigord very few deposits of this period. 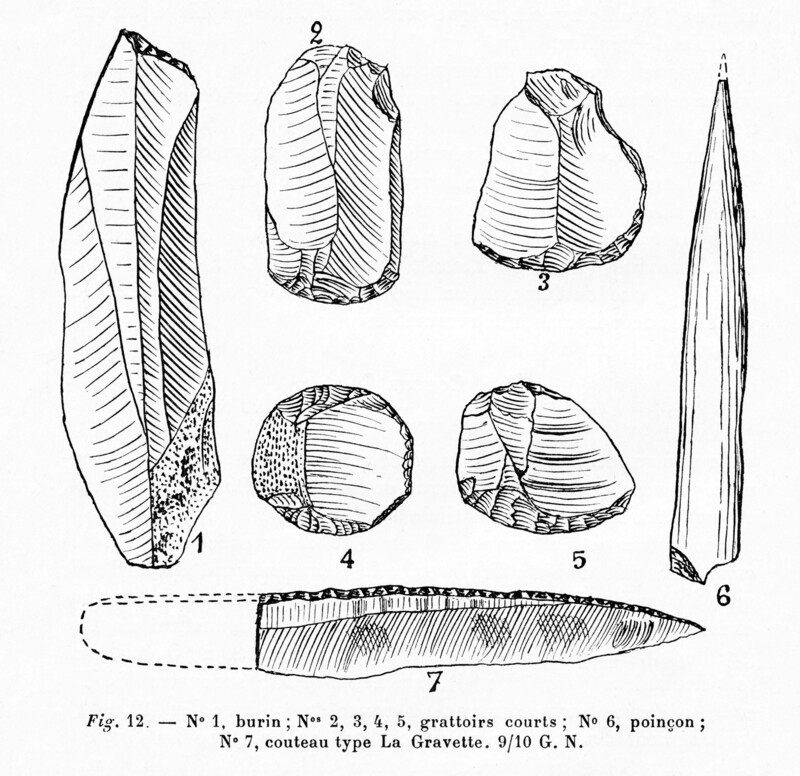 My excavations, in the sites of the Château des Eyzies, at Longueroche and Villepin, have shown, that in the absence of the aforementioned objects, blades with a curved blunted edge, small scrapers on chips and engraved pebbles clearly characterise this time in the Perigord. Thus, the list of Perigordian Azilian sites is considerably increased. To those already mentioned, we must add the grotte des Eyzies, La Madeleine, Cap Blanc, Valojoulx, Font Brunel, commune of Limeuil, Lestrugue, commune of Trémolat, Le Goulet, commune of Mauzac, La Peyzie, commune of Lisle. Mes fouilles, dans les gisements du château des Eyzies (Musée), de Longueroche et de Villepin, ont montré, qu'en l'absence des objets susdits, les lamelles à bord courbe abattu, les petits grattoirs sur éclats et les galets gravés caractérisent nettement cette époque. De sorte que la liste des stations aziliennes périgourdines se trouve, de ce fait, considérablement augmentée.· A celles déjà citées, il faut ajouter la grotte des Eyzies, La Madelei'ne, le Cap-Blanc, Valojoulx, Font Brunei, commune de Limeuil, Lestrugue, eommune de Tr~molal, Le Goulet, commune de Mauzac, La Peyzie, commune de Lisle. This small deposit has not yielded as many objects and works of art as the large classical shelter of La Madeleine, located next door; but, being completely virgin and having been searched with the greatest care, it made it possible to specify still obscure points. The lower two levels, merging in the East, belong to the Upper Magdalenian (the level of harpoons with two rows of barbs, the Magdalenian VI of Breuil). But that of the base is characterised by barbed harpoons barely detached from the shaft, while the other has quadrangular very detached barbed harpoons, long truncated blades and scrapers on fragments, sometimes discoid. Three pieces of a type not previously published: a fouêne (Fig. 7, Nos. 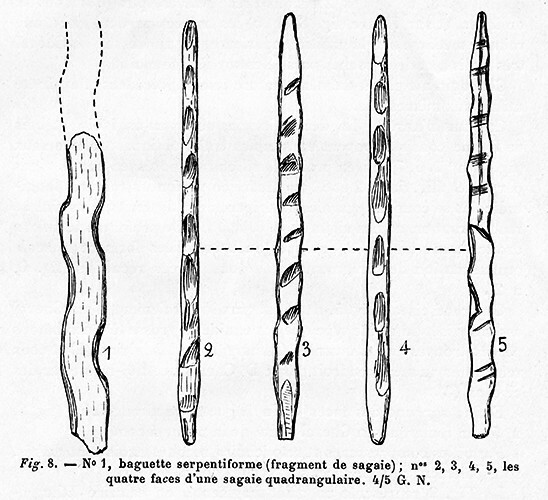 3 and 4), a sinuous rod (Fig. 8. No. 1), and a quadrangular spear (Fig. 8, Nos. 2, 3, 4 and 5), come from the latter. 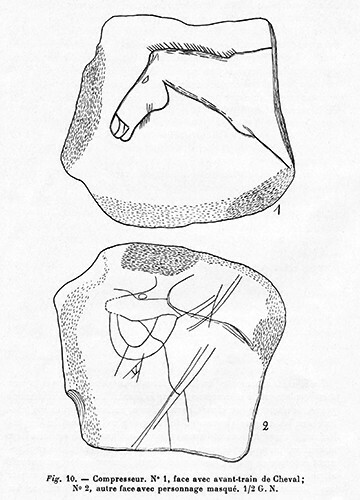 Calcareous and schistose pebbles, sometimes used as retouchers or as a sewing thimble, engraved either on one side (Fig. 9) or on both (Fig. 10), sometimes coloured red and engraved (Fig. 10, No. 2), and Fig. 11, Nos. 1 and 2) have features that are still not often observed. The Longueroche site had made known the industry of the Perigordian Azilian; this one presents us with its art and lets us glimpse the possibility of encountering some day coloured and well preserved pebbles. 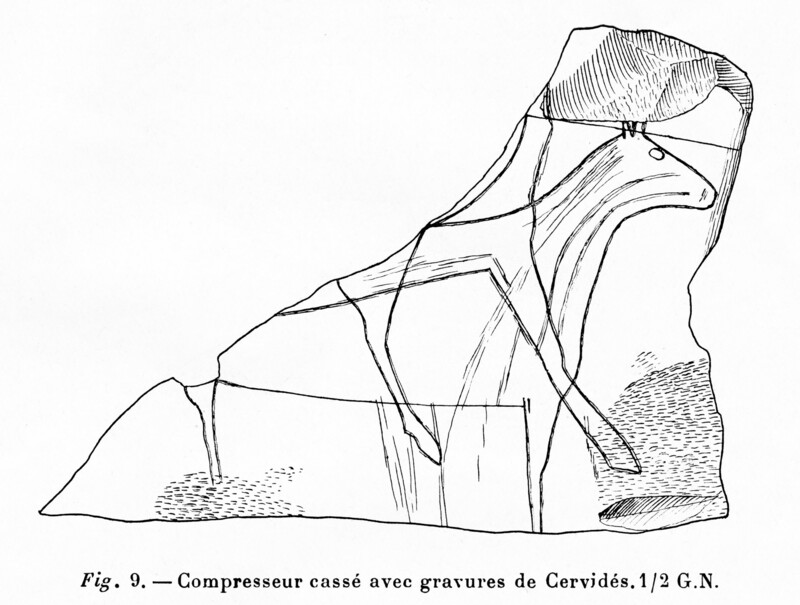 Peyrony D., 1933: Les Gisements préhistoriques de Bourdeilles, Archives de l'Institut de Paléontologie humaine, Mémoire No. 10, 1933, Fig. 39 à 42.